Company JAC Vapour was a new UK company formed to meet the growing demand for electronic cigarettes in the UK in 2010. Since then they have grown to become one of the leading suppliers of quality e-cigarettes, and continue to lead the way with the latest technology. A Scotland-based electronic cigarettes distributor, JAC Vapour has aspirations of capturing the majority of United Kingdom’s e-cigarette market share. It’s a relatively new company in comparison to other big entities in the U.K.’s electronic cigarette market, but customers shouldn’t allow this fact to influence their opinion about this brand. JAC Vapour has a pretty impressive range of electronic cigarette products, apart from a highly functional and attractive website. If you’ve ever searched online to buy your first electronic cigarette, you’d know how difficult it can get to pick the right one. This is where the JAC Vapour comes into the picture and helps first time as well as seasoned customers buy the right products for their needs. 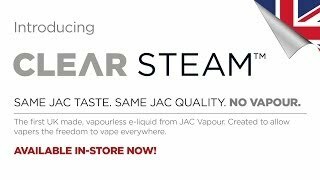 JAC Vapour makes shopping of electronic cigarettes a hassle free and easy affair by offering easy to understand descriptions and products on its website, thus enabling even the less informed users make the right purchase. So, regardless of whether you are a complete newcomer or an e-cigarette veteran, JAC Vapour can help you find the right e-cigarette. The product range available with JAC Vapour appeals to all types of e-cigarette users. The brand carries enough types of accessories to support each one of its products. Starter kits can be bought for both E-go style and mini vapourisers. You can also buy carry cases, chargers, batteries, extra cartomizers, E liquids and much more. JAC Vapour even has a disposable starter kit available for users who wouldn’t like to spend on a charger before actually trying the product. The brand has a very impressive range of E liquid flavours, making them one of the most preferred choices of customers wanting something different from the traditional tobacco flavour. With regard to its packaging, most of the JAC Vapour’s electronic cigarettes come in traditional style card cases, in their respective starter kits. You can buy other accessories to complement these cases. For instance, there are faux leather cases available for the e-cigarettes, tins which can hold the E liquid refills, athletic and sporty zip up cases for the E-go style vapourisers and more. JAC Vapour has done an exceptional job at providing high-quality carrying cases and packets for their products. Although such offerings are less likely to attract the new age e-cigarette users, the ones who are more inclined towards high-quality, functional and traditional e-cigarette products have all the reasons to feel elated. The design aspect is also in the same vein as the packaging. While there are some excellent introductory products, each one of them being functional and attractive, JAC Vapour does lack that modernity needed to appeal to the younger audience. 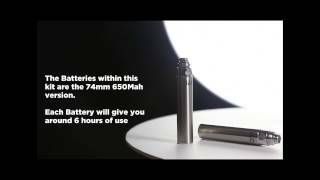 The batteries that power the JAC Vapour e-cigarette products easily outweigh the competition in terms of their performance. Despite the fact that they need to be recharged after use, they do last a pretty long time. 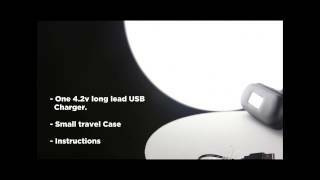 The batteries can be recharged using the Portable Charging Case (to be bought separately) – PCC, which is a high quality and slim battery charging case made of aluminum. The case is quite portable as it can be slipped in and out of pockets very easily. The batteries can be easily recharged and don’t take more than 2 hours to get fully charged. I advise that when buying the JAC Vapour starter kit, opt for an extra set of batteries. This way you’ll always have fully charged batteries available for use and will never run the risk of going without vape. Many reviewers are of the opinion that the JAC Vapour batteries perform the best when they are fully charged and they last long enough to give similar category batteries a run for their money. A large majority of JAC Vapour users feel that the vapour produced by their e-cigarettes is very good. Some even stress that one doesn’t need to put those primer drags to get the e-cigarette to produce quality vapour levels. This is a very positive point in favour of the JAC Vapour e-cigarettes. JAC Vapour easily scores over the competition when it comes to both real tobacco and other flavours. There are 3 different varieties of E liquid flavours that can be purchased. First one are the standard E liquid flavours having 24 different options ranging from apple, cherry, cappuccino, grape, coffee, chocolate, menthol, mint, several variants of tobacco, watermelon, vanilla and more. Then there are UK made E liquid flavours available in 32 different tastes such as: banana milkshake, blackcurrant, bubblegum, black coffee, pure menthol, real coffee, real tobacco, smooth cigar, spearmint, strawberry and more. You can also buy some clear steam E liquids which are meant specifically for minimising the vapour production. These are available in 6 different flavours – banana milkshake, real tobacco, taster tin, strawberry chew, real vanilla and pure menthol. One reason why more and more people are opting for the JAC Vapour e-cigarettes, despite them being fairly new in the marketplace, is the kind of nicotine strength they provide. The nicotine levels are mostly dependent on the flavours you choose. However, you are guaranteed to find a strength which will exactly match your needs and tastes. To give you an example, the regular tobacco flavour comes with nicotine levels varying from 0 mg to 24 mg. Most of the JAC Vapour users and reviewers agree to the fact that all JAC Vapour e-cigs deliver a very satisfactory throat hit. As shared earlier, JAC Vapour is a Scotland-based electronic cigarettes distributor. The company was founded in the year 2010 by an ex-smoker. He used to find buying e-cigarettes a difficult as well as confusing task. He created JAC Vapour out of his keen desire to deliver amazing and technologically advanced e-cigarettes to the general populace. His main idea was to make e-cigarettes easy to understand and easy to use for common people. The company is registered in Young Street, Edinburgh, Scotland. Even though they don’t have a direct telephone number available to contact them for support services, they do take customer support quite seriously. The only way to get in touch with them is via email, using the contact form on their website (on the ‘Contact Us’ page). They promise a turnaround time of 24 hours and reply fairly quickly if contacted during the business hours, which are from 9 AM to 6 PM during the weekdays. Any orders more than £ 50 are shipped completely free of charge by JAC Vapour, provided they are going to the UK addresses. In case of international orders, all packages valued over £ 60 are shipped free of cost. However, international packages obviously take comparatively longer to arrive at their destinations. The exact shipping times vary from destination to destination. Please visit the JAC Vapour official website to learn more about the shipping options and estimates. All products purchased from JAC Vapour come with a comprehensive 14 days money back guarantee. This means that if you buy any of their products and feel that it’s not meant for you, you can return it back and ask for a complete refund without any questions asked. However, please note that this 14 days money back guarantee excludes E liquids and Cartomizers. Now coming to the amount of money it may cost you to use JAC Vapour e-cigarettes in the long run, it will depend entirely upon the number of cigarettes you smoke per day. Nevertheless, to give you an example of a typical situation, let me state that a full cartomizer is equal to around 20 analog cigarettes. And a 5 refill cartridge pack is going to set you back by £ 6.79 on average. – Has a pretty wide range of e-cigarettes and flavours accommodating the needs of all levels of smokers. – All JAC Vapour products are of extremely high quality and finish. – JAC Vapour team spends a lot of time on making it easy for the end-user to select the right product for his/her needs. – The products at JAC Vapour are priced quite competitively and suit all budgets. – Although, the prices of JAC Vapour are quite competitive, their starter kits are slightly more expensive than the competition. – JAC Vapour doesn’t have a good variety of disposable e-cigarettes. However, this shouldn’t ideally be a cons as they cater mainly to serious e-cigarette users. Nevertheless, they do have a disposable starter kit priced quite reasonably. It’s just that they don’t have many options in this category. All in all, JAC Vapour has some excellent products available at fantastic price points. Their variety of flavours is simply awesome and the overall product variety caters to all customer types. Furthermore, they make it quite easy for the first time e-cigarette users to find the kind of products to suit their needs. In a nutshell, their e-cigarette product lineup is functional, attractive and ideal for advanced, intermediate and beginner level users. Despite the fact that JAC Vapour doesn’t put an equal amount of effort as some other companies to make their products appealing to all age groups, especially the young smokers, they have emerged as a fairly strong e-cigarette brand in the market. Moreover, they don’t believe that youngsters are really their niche either. JAC Vapour’s strength lies in its own as well as its target market’s simplicity. Their focus remains on creating high-quality e-cigarette products, make them easy for users to buy and offering them at attractive prices. Visit Jac Vapour Official Website to Learn More. Cannot fault this company, the best e-cigs provider in UK by a mile! I'm very surprised this company hasn't got a 5 star or '10 out of 10 rating'. There's nothing you can fault. I can understand there's a cheaper bunch out there, and some shops charge less for delivery (or either it's free) but in terms of being professional, user-experience and quality of products this is a true winner. Highly recommended! I can recommend this company and have recommended it to 2 other friends whom received the same fast shipping, only a couple of days from ordering from the homepage to receiving the e-cigaret and this is shipping to Denmark. The e-cigaret they sell are among the best and their cartridges can be used a lot of times for refill without tasting bad!!! Brilliant company, products and customer service. I started using them a year ago, a few months ago I bought what I thought were the same products from other brands as they were cheaper - but they were no where near as good as my JAC Vapour batteries and tanks. It pays to buy quality, as hardware I bought a year ago from JAC is still going strong whereas the batteries I bought from the vape shop died long ago. Can't fault them. Their customer service guys are really friendly and knowledgable too. In my opinion Jac Vapour has the best quality ecigs in UK. I've tried many but been vaping JacVapour for about 5 month now and love it. Great products and a huge choice of flavors. Awesome products! I started with few different starter kits from different brands to begin with and JacVapour really stood out so I stuck with it. Now ordered my first EGO kit and can't wait to try. Will write another review afterwards. Keep up the good work JV. I've used these guys for over a year now, and their products are top notch plus I have 100% confidence in the safety of their items. As stated they may be a few quid more expensive than some but the extra money is well spent. I don't really think you can call not supplying a wide range of disposable ecigs a con, as they only really put out quality products that last which kind of flies in the face of disposables and is a plus for me. The only downside I see is the shipping is a bit pricey, having said that deliveries arrive the day after I order, even on standard shipping, so considering the speed of the service I'm not complaining. Rubbish - cant talk to anyone either.